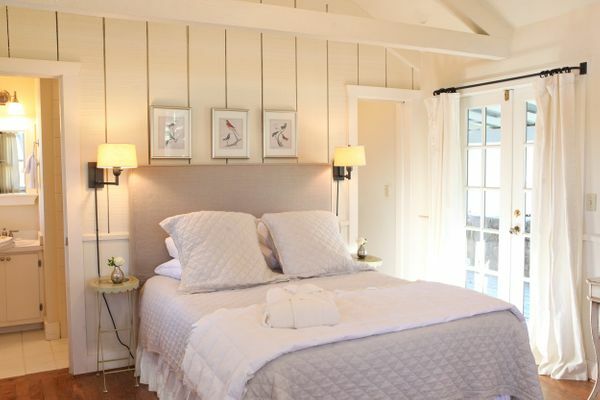 Ivy is a sunny room that has a charming upholstered bed and painted furniture which gives it a cottage feel. A small sitting area is situated at the end of the bed. Double French doors lead to a private covered porch furnished with wooden rocking chairs and a bistro table and chairs to enjoy the morning sunshine while eating breakfast. The bathroom has a step-in shower. $150- $180 a night. Sleeps 2. 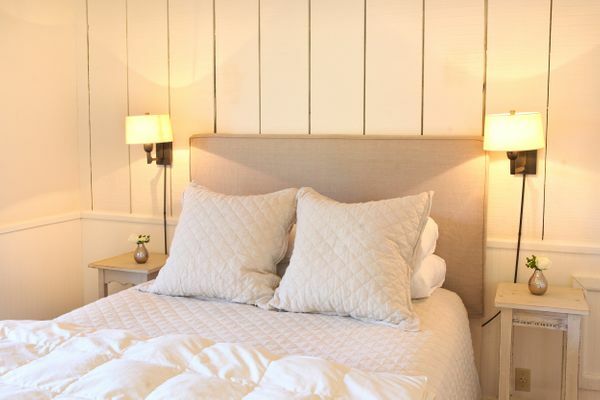 Cozy and luminous, Indian Paintbrush has a bed with an upholstered headboard and trunk from Provence. Comfortable armchairs provide a sitting area. Double French doors lead to a private covered porch furnished with wooden rocking chairs and a bistro table and chairs to enjoy the morning sunshine while eating breakfast. The bathroom has a step-in shower. Located in a ground floor attached cottage, the entrance to this elegantly rustic room is through a private courtyard and double French doors. 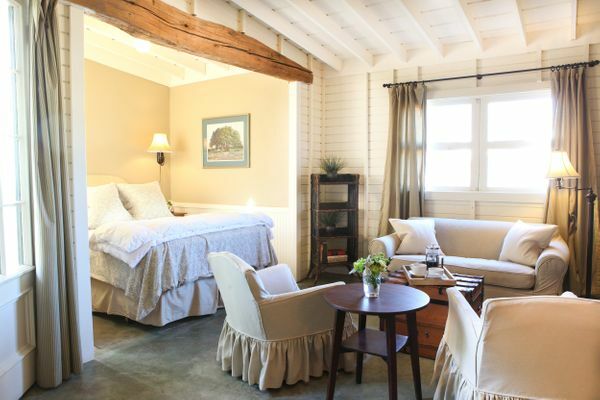 The bed is tucked away in a charming sleeping alcove. A cushy loveseat and two comfortable armchairs make up the sitting area, along with an antique table and chairs for dinning. The bathroom has walk-in shower. $165- $190 a night. Sleeps 2. 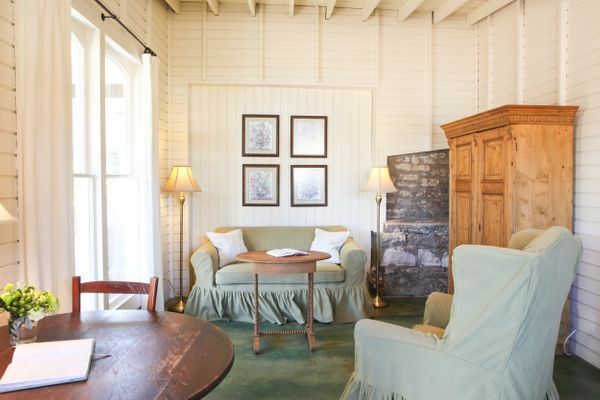 Located in a ground floor attached cottage, Calico has a mixture of slipcovered furniture, an antique pine armoire, which serves as a butler’s pantry, and a comfortable iron bed. The covered front porch has a lovely sitting area with two Adirondack chairs. The bathroom has a walk-in shower. Emily Morgan is located above the Great Hall, with a private entrance that leads to the cozy and delightful room. 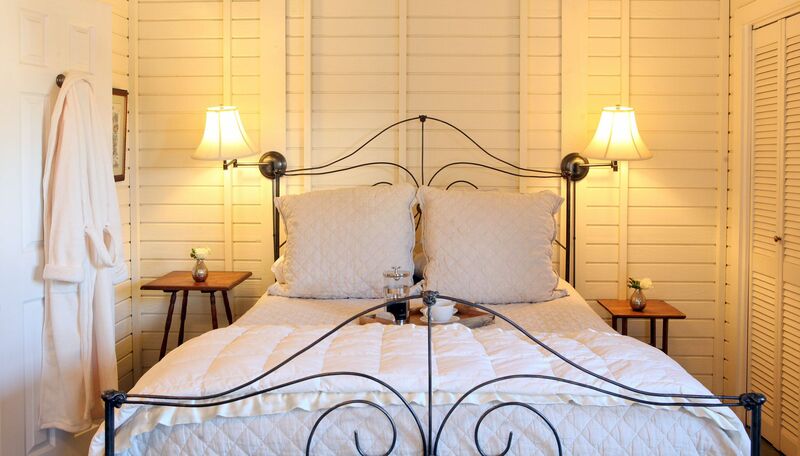 It has a lovely antique mahogany bed with a quilted toile coverlet and a slip-covered loveseat. The bathroom has a step-in shower. Located above the Great Hall, Crockett has a private entrance that leads to a room that is decorated in classic Texas style. From the mahogany bed to the leather chairs to the deer antlers on the wall, this room provides the highest level of comfort. The bathroom has a step-in shower. 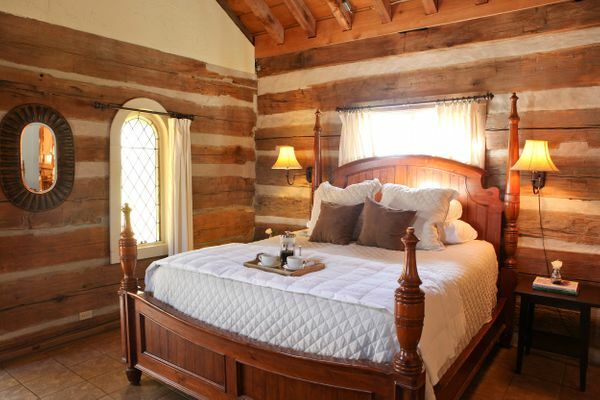 Located in one half of an 1840s log cabin, Morning Star embodies rustic elegance. The private covered porch, with a swing glider, is the perfect place to relax. 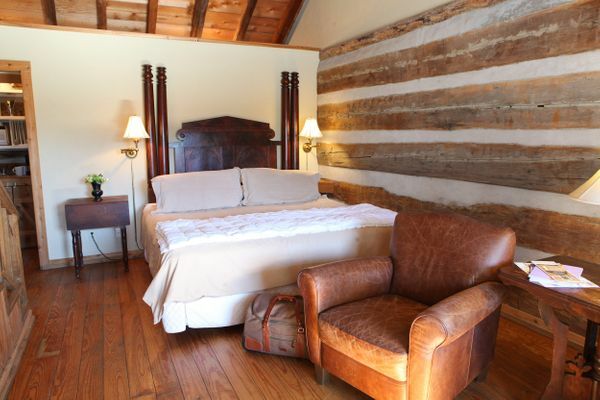 The large room has an inviting living area with a leather sofa and chair, an antique pine bed and primitive antiques. Morning Star has a limestone fireplace with candles. The bathroom has a large tub with a fixed shower. $185- $225 a night. Sleeps 2. 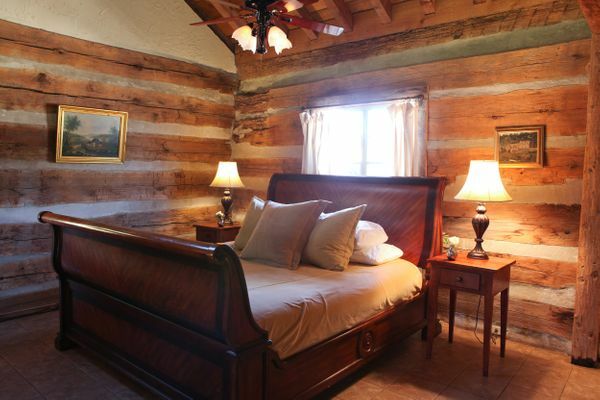 Located in one half of an 1840s log cabin, Evening Star embodies rustic elegance. The private covered porch has a sitting area that looks out over a lovely manicured lawn. 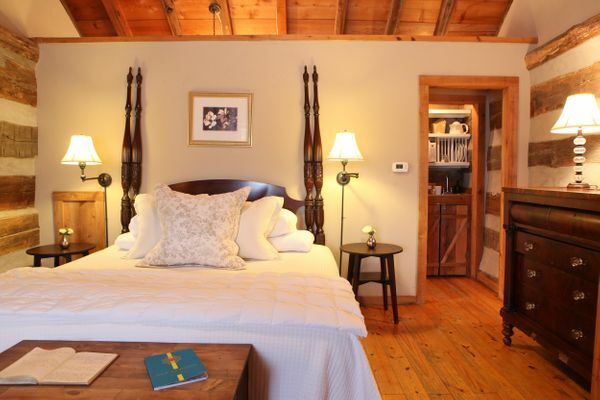 Inside, the large room has a stunning mahogany sleigh bed and a sitting area with an overstuffed sofa and chairs. Evening Star has a limestone fireplace with candles. The bathroom has a large tub with a fixed shower. At the corner of our property, Ada’s Cottage is secluded and quiet. It is decorated in soothing greys and creams. 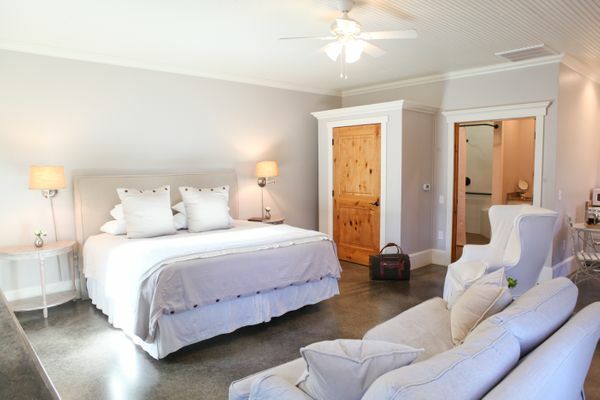 The bedroom has a king size bed, comfortable slipper chairs and a butler’s pantry nook with low counters. The bathroom has a generous shower with two rain shower heads. This unit also adheres to ADA regulations. The cottage has private parking. $215 to $265 a night. Sleeps 2.